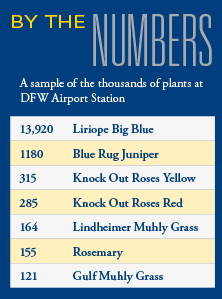 Visitors arriving at DFW Airport Station will notice that it looks as much a part of the airport as it does the DART Rail System. Since the beginning, DART's award-winning Station Art and Design Program has ensured that stations both reflect and serve as gateways to the surrounding community. The architects reimagining the legacy areas of Dallas/Fort Worth International Airport incorporated colors and materials found throughout the airport property into the station design. Passengers waiting on the platform (located near Terminal A's lower level) can watch airplanes taxi down a runway or soar through the sky, as well as see the Skylink train pass by overhead. The most distinctive design element at the station is the tensile-fabric canopies that arch over the station. 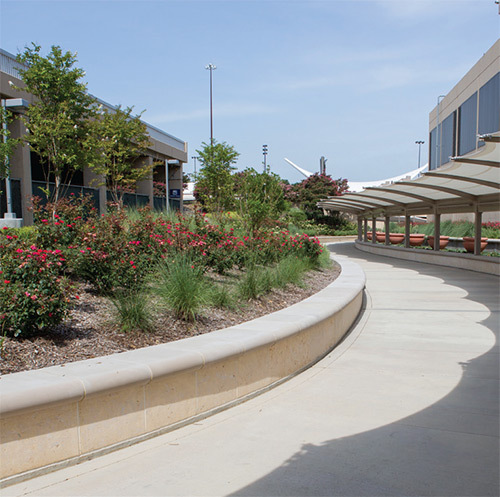 Similar tensile-fabric awnings line the walkways leading from the station to both Terminal A and Terminal B. 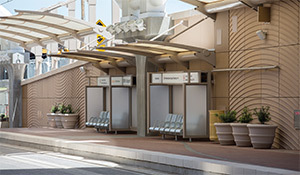 The structures offer the maximum amount of shade while serving as a visible icon for the station for customers using Skylink or the roadway systems. Immense walls rise on either side of the station to the street level above, further shading the platform. Portions of the walls feature a wave pattern cast in glass fiber-reinforced concrete, a subtle reference to the DFW Airport logo. Galvanized steel chairs provide weary travelers a comfortable place to rest as they await the next train. The material will both withstand the elements and weather to a silvery patina. Seating walls line the walkway between the station and terminal to create additional areas to sit. Convenience outlets located at the base of the walls offer travelers a place to charge small electronics. The walkway is landscaped with crape myrtles and 600 red or yellow Knock Out roses - and that's only the beginning of the thousands of drought-tolerant trees, bushes, ornamental grasses and groundcovers that surround the path in a garden-like setting. This walkway serves as a new front door to welcome passengers arriving at DFW Airport and showcases the beauty of North Texas.